The Linx 1020 Tablet and keyboard combo are an essential device that offer everything you need to work hard and play hard. Featuring a top-end processor, large 10” display, Windows 10 and enhanced connectivity. Perfect for those who want to switch between the freedom of a tablet and the functionality of a laptop. 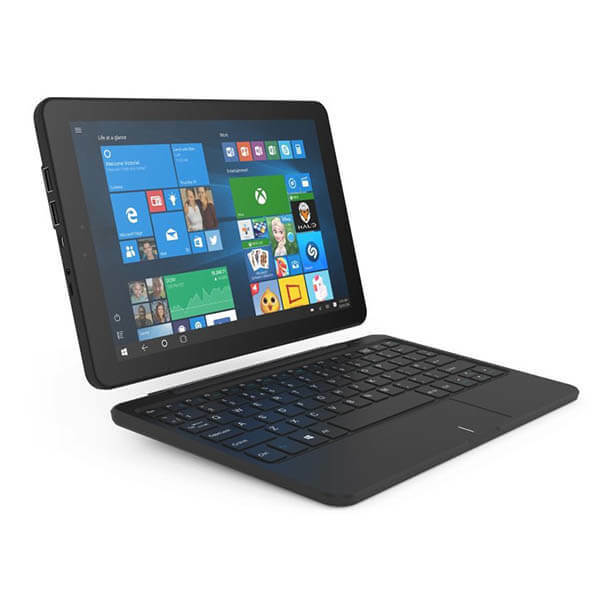 The Linx 1020 is a well-built tablet that offers a great value for the asking price. Featuring a high-end processor, large immersive screen, free keyboard and Windows 10 professional. The Linx 1020 is perfect for giving to your kids to browse the internet or for using to complete projects for work. The Linx 1020 looks great from all angles, it could even be mistaken for an iPad mini if it wasn’t for the sizable windows logo on the front. Built using high-quality materials, the tablet feels very lightweight for its size at only 640g. The rear of the tablet is coated with a rubber material that provides a strong and secure grip when in your hand or on a flat surface, it also prevents the rear panel becoming a massive fingerprint magnet. At the top left corner you will find a 2-megapixel camera, and at the bottom you’ll find two fine-tuned speakers covered by a metallic grill. To the side of the device you’ll find a volume rocker and power button, these keys protrude out slightly which makes them easy to find when in the dark. Fitted with an 10 inch IPS TFT LCD screen with 800x1280 resolution and pixel density of 188 pixels per inch. The display is superb and delivers a wide spectrum of vivid colours with perfect contrast ratios. The screen also offers incredible brightness allowing picture-perfect viewing from any angle and great clarity both indoors and under direct sunlight. The exclusive Linx connector allows you to take your tablet experience to a bigger viewing platform with compatible Link tablets. Easily move from your tablet to a full desktop set up through the Linx docking hub. You can also enjoy your favourite games by streaming directly from your gaming console, just connect your controller, set up network login and then begin streaming. Powered by the quad core Intel Atom x5 with 2GB of RAM, the Linx 1020 can be compared to a handheld PC with so much processing power. Whether you’re planning an important owkr document or you want to play the latest 3D games, expect the Linx to respond with lightning-fast performance without any signs of slowing down. The tablet features 32GB of internal memory which can be expanded by up to an extra 64GB via the microSD card slot. You can also expect the Linx 1020 to last up to 8 hours thanks to the integrated 7,000 mAh battery, perfect if you need an entertainment or productivity source when on a long journey.